Michael Jordan idolized North Carolina State's David Thompson as a youth and grew up rooting for the Wolfpack, so it's a testament to North Carolina coach Dean Smith and his staff that they still managed to wrest the Wilmington native away from their rivals. They discovered Jordan before any other ACC program thanks to a tip from the athletic director in his county. They made landing Jordan their top priority when he dominated at Smith's basketball camp the summer before his senior year. And they out-recruited the likes of Maryland, South Carolina, Duke and NC State after other schools became aware of Jordan's talent when he emerged as the best player at the prestigious Five-Star Camp in Pittsburgh later that summer. "When I first saw him, he jumped out at me because of his athleticism and competitiveness," then-North Carolina assistant coach Bill Guthridge said. ""I thought we should recruit him, but I didn't know how good he would be." 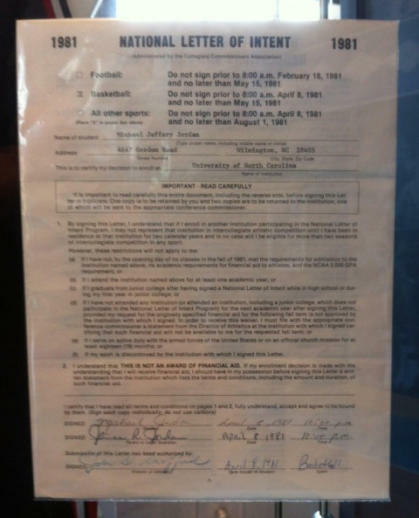 The story of Jordan's recruitment is timely today since the Jordan Brand tweeted photos of a 1980 recruiting letter from coach Dean Smith and the 1981 letter of intent he signed with North Carolina hours before the Tar Heels hosted Duke on Wednesday night. Both those pieces of memorabilia hang in The Carolina Basketball Museum in Chapel Hill. 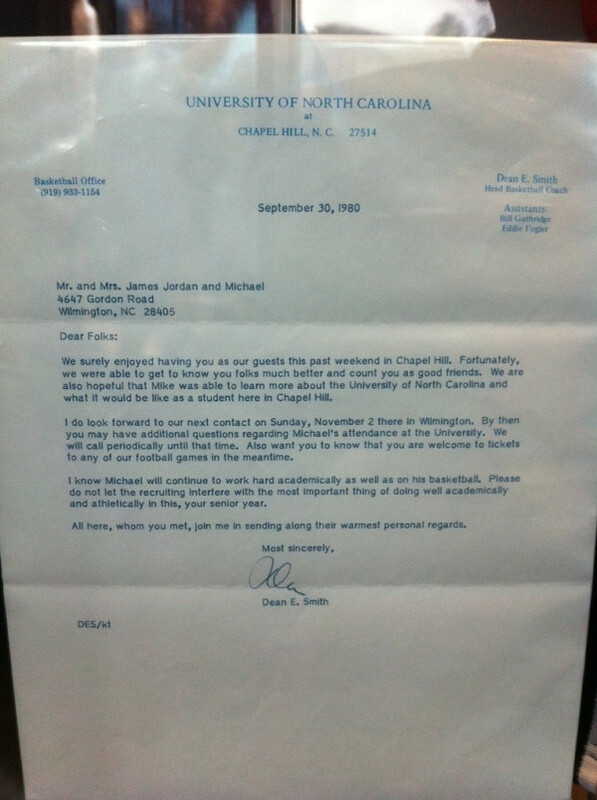 The letter from Smith is typed in Carolina blue font and addressed to Jordan and his parents. Proving that coaches believed families were more naive about the business of recruiting three decades ago, it begins: "We surely enjoyed having you as our guests this past weekend in Chapel Hill. Fortunately, we were able to get to know you folks much better and count you as good friends." Guthridge attributed North Carolina's ability to discover Jordan first to the emphasis Smith had placed on in-state recruiting. Whereas past Tar Heels coaches won by getting the best players from New York to come to Chapel Hill, Smith built his program with North Carolina-born players like Phil Ford and James Worthy. "Coach Smith had a rule that we didn't want to ever bypass a player from North Carolina," Guthridge said. "If there was a real good player in NC, we didn't want to lose him." Jordan was an instant success at North Carolina during the 1981-82 season, earning ACC freshman of the year honors and famously sinking the game-winning shot in the national title game against Georgetown. It wasn't until preseason practices before Jordan's second year, however, that the North Carolina coaches realized they might be coaching one of the best ever. "We couldn't believe how good he was as a sophomore," Guthridge recalled. "We ran a drill in practice where players went one-on-one against each other. There was nobody who could stop Michael and Michael could stop everyone. That was really something then." In his three seasons with the Tar Heels, Jordan averaged 17.7 points per game and shot 54 percent from the field, winning the Wooden and Naismith player of the year awards as a junior. Despite all of that success in Carolina Blue, Jordan never forgot one aspect of his childhood affinity for rival NC State. The person who Jordan asked to present him at the hall of fame in 2010 was none other than David Thompson.